Paulina Bentley discusses the importance of acknowledging the histories and voices of Maori and Pacific women. Do we ever stop to think about the women in our lives and what they have done for us? The women who move to a new ocean with a different mother tongue, who raise children by themselves. The girls who give you a pad no questions asked even though they’re stupidly expensive? This International Women’s Day (March 8) our small nation should be proud of our achievements for and from women. Dating back from Adam and Eve, to Rick Grimes, and now Donald Trump, men continue to believe they are authoritarians who rule over women. International Women’s Day is a celebration recognising the contributions all women have made in Aotearoa. To acknowledge the different struggles women face around the globe. In our hemisphere it’s time we start giving a damn about Pacific and Maori women and our histories. As we find ourselves flowing back into our daily routine at uni, or starting to find our rhythm for new students (Welcome! Prepare to be #Stressed), I’m reminded of my history class where my Samoan lecturer said, “The University of Auckland prides itself on being a Pacific university, however they do the bare minimum when choosing to actively silence non-Western history ”. This course would be terminated the next year and was the only Pacific History course. “Bare minimum” becomes “complacency” when units such as these are removed from curriculums. New Zealand actively silences and whitewashes brown bodies in education. They choose to eliminate the history of Pacific and Maori women in favour of vulgar words by white male historians and anthropologists. With International Women’s Day around the corner New Zealand’s education system has historically disregarded Pacific and Maori women scholars. Teresia Teaiwa – a Pacific scholar, Dame Whina Cooper – a respected Maori activist and Margaret Mead – a white anthropologist. Who do you think is the respected woman to seek knowledge of on the Pacific? Because the education system prefers Mead over Pacific scholars and people. Personally, as a second generation New Zealand born Samoan, I feel that the history and knowledge of the Pacific isn’t important. It isn’t important because we never learnt anything about the Pacific in our streamed education system. Not once. This country is located in the Pacific, it is a point within the Polynesian triangle and yet many of us seem to not fully comprehend the capacity of our nations Polynesian roots. Although the Pacific and Maori Studies course is a step forward for Indigenous visibility in tertiary education, some feel the need to complain about how Pacific and Maori communities support each other. Individual non-Polynesian students have created a notion that we’re “privileged” to study at university. In my first year, I often saw this anger through social media and experiences recalled by older friends. To see white university students on social media mock Tongan students and say “Finally Tonga is colonised!” during the Rugby League World Cup was sickening. Why were white students so offended by Tongan students supporting their country? The repetitive and hollow insults thrown at Pacific and Maori students for daring to study has led to thick skin for many of us. There are many problems that Pacific women face at university that white women do not. One: Feeling uncomfortable being the only Brown girl in your lecture. Two: Mark thinks he is being subtle referring to “your people” in tutorials. Three: Uncalled for anger at support dedicated to Pacific Island/Maori students. I could write a whole list if I wanted to (But I have a word limit so be thankful). It may seem as if I’m pitting women against each other. If you’re reading the three points with annoyance in your chest then you have some reflecting to do. This though is the truth that all Island girls studying have to deal with. Sometimes it’s not much. Just an odd jab, an irritated twitch of the eyebrow, a great masterpiece of a scenario brewing in your head. Other times, it’s unmanageable. Oppressive. It’s always funny to hear, “But why isn’t there a European/Pakeha club?” and a cause for a major eye roll considering it’s so simple. This whole university is your club. Now listen, I am not here to fight. 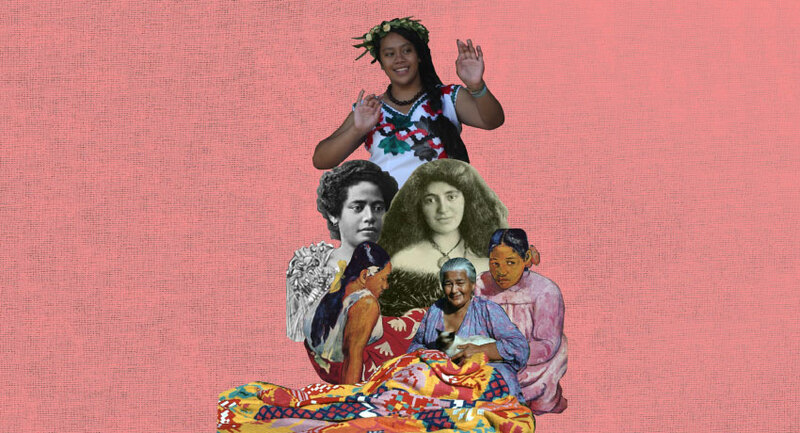 Instead I simply want to use this platform to recognise Pacific and Maori students out here at UoA, but especially to acknowledge the women that paved the way for us to be where we are today. We all have women in our families. Our mothers, sisters, aunties, grandmothers, friends. In a Polynesian context, men are seen as our pillars within the fale. In reality however, it’s the Pacific and Maori women who are our strongholds, our Bosses™ and our hearts. I grew up in a very matriarchal family and to this day we still retain a matriarchy with my grandmother as the Final Boss™. Cliche as it sounds, without my grandmother I would not be who I am. I would not be where I am either. I would not have my love to learn. Here at the University of Auckland, Pacific women who have created an impact for me include Dr Tarisi Vunidilo who was my tutor for Pacific History as well as my Fijian dance lecturer and my Tuakana tutors who always came through and fed me. As well as encouraged me to attend classes and help with work I didn’t quite get. All of us are blessed to know women that have helped shape our worldviews and brought us into existence. If you don’t know anyone of Polynesian descents and/or are not of any Polynesian descent, our definition of “family” does not stop at our second cousin twice removed. It stops at our mum’s-cousin’s-aunty’s-neighbours-daughters-wedding-and-your-family-from-Samoa-rang-for-$100-to-help-out. That’s where it stops. Strange as it sounds, the definition of ‘family orientated’ comes with a whole different price in a Brown context. The saying, “It takes a village to raise a child” certainly rings true to every Polynesian student out here.